The battle over the fate of a 25-year-old federal drug discount program could heat up on Capitol Hill this year. At issue is the 340B discount program, which safety-net providers such as hospitals use to obtain often steep discounts on medications from pharmaceutical companies. Covered hospitals and clinics saved approximately $6 billion on their outpatient drugs on approximately $12 billion in discounted purchases during calendar 2015 through the program, according to a recent congressional report. Possible changes offered in Congress could trim the number of hospitals in the program or impose new reporting burdens on the hospitals getting the discounted drugs. Hospitals also are reeling from a recent Medicare rule from the Trump administration that went after the 340B program hospitals by eroding the margin between what they pay for drugs and what Medicare pays for dispensing the same medications. “It’s going to be an active year,” for the 340B program, attorney William von Oehsen with Powers Pyles Sutter & Verville PC told Bloomberg Law. Von Oehsen, who has worked with hospitals, clinics, and other covered entities that get discounts, expects a big legislative battle over the future of the 340B program, adding that a House panel recently laid the foundation for its possible legislative changes. Big pharma and some congressional Republicans want changes to the program because they say it has grown beyond its original intent of helping hospitals and other eligible entities stretch their resources to provide care for uninsured and underinsured patients. On the other side of the coin, the hospitals and other health-care providers using 340B say they need the savings from the program, and any changes could hinder their ability to provide care. The 340B program, created in 1992, requires drug manufacturers to provide outpatient drugs to eligible health-care providers at significantly reduced prices. A sign of what’s to come could be in the Jan. 10 House Energy and Commerce Committee report that provides recommendations for how the program could be improved. Committee Chairman Greg Walden (R-Ore.) said during a press call on the report the committee will be advancing legislation on the program in the first few months of 2018 and it’s one of his top priorities. Von Oehsen also said Rep. Chris Collins (R-N.Y.), a member of the Energy and Commerce Committee, has come up with a draft 340B bill that would impose a number of restrictions on the program. For example, it would set limits on arrangements where 340B entities contract with third-party pharmacies to dispense 340B drugs, redefine eligible hospitals, and impose reporting requirements, he said. The Health Resources and Services Administration, the agency that oversees the program, in 2010 issued guidance allowing covered 340B entities to contract with an unlimited number of third-party pharmacies to dispense 340B drugs. “But I also think you’re going to have bills introduced that would expand the program or make it better in different ways,” von Oehsen said. The congressional report points out some of the flaws in the program and it could serve as a catalyst for legislation, Attorney Stephanie Trunk told Bloomberg Law in an email. Trunk is with Arent Fox LLP in Washington and she represents pharmaceutical manufacturers. Trunk also said the report highlights that “while the 340B program has exploded in recent years, HRSA resources to oversee the program have not” and she is hopeful Congress will provide the necessary resources for HRSA to oversee the program. Trunk is a Bloomberg Law advisory board member. In 2013, there were 7,806 hospitals participating in the 340B program, and in 2017 that number grew to 21,554 hospitals in the program, according to the Government Accountability Office. 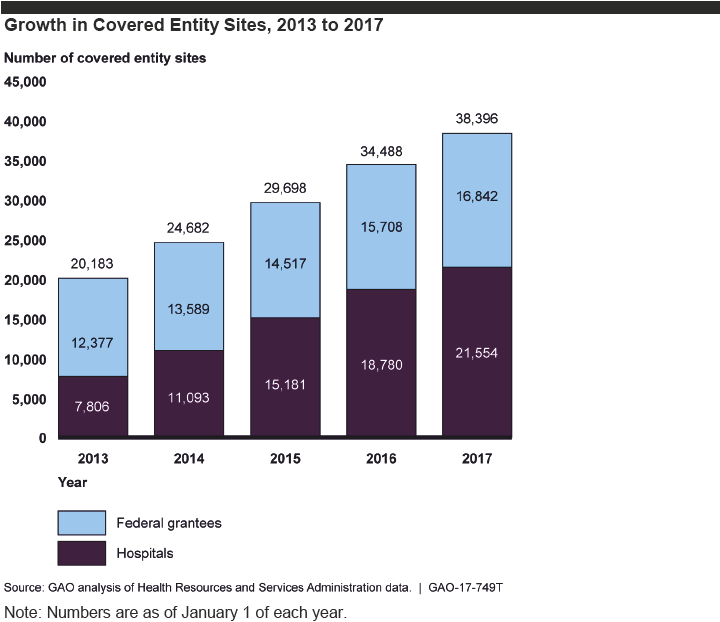 Federal grantees---health-care entities receiving one of 10 types of federal grants---also are eligible to participate in the 340B program. Grantees, such as Ryan White HIV/AIDS clinics, typically include clinics that offer primary and preventive care to uninsured or vulnerable patients. The GAO said the number of federal grantees in the program increased from 12,377 in 2013 to 16,842 in 2017. Another big issue for the 340B program is a final rule that cut Medicare payments in 2018 to covered entities for their discounted physician-administered drugs obtained through 340B. That rule has been opposed by hospitals because it reduces by nearly 30 percent, or $1.6 billion, the Medicare Part B payments for 340B drugs. “Our number one priority will be to address the draconian Medicare Part B cuts,” Ted Slafsky, president and chief executive officer of 340B Health, a group that represents hospitals and health systems that participate in the program, told Bloomberg Law. Slafsky said his group will work to get those cuts reversed and will continue to support H.R. 4392, which would rescind the cuts. Rep. David B. McKinley (R-W.Va.) introduced the bill in November 2017 and it currently has 176 co-sponsors. Hospitals don’t like two similar bills introduced by Republicans in the Senate and House that would temporarily pause new enrollment of disproportionate share hospitals into the 340B program and require 340B hospitals to report certain data. Disproportionate share hospitals serve a large number of low-income patients and receive payments from the Centers for Medicare & Medicaid Services to cover the costs of providing care to uninsured patients. Sen. Bill Cassidy (R-La.) Jan. 17 introduced the Helping Ensure Low-income Patients Have Access to Care and Treatment (HELP) Act (bill number not available), and Rep. Larry Bucshon (R-Ind.) introduced the 340B Protecting Access for the Underserved and Safety-net Entities (PAUSE) Act in December 2017 ( H.R. 4710). “The HELP Act has a bit more ‘meat’ to it than the PAUSE Act,” Trunk told Bloomberg Law. Both would put a moratorium on new hospitals entering the 340B program, but their reporting requirements differ, she said. The PAUSE Act would require 340B entities to report 340B savings and how they use the savings, Trunk said. The HELP Act wouldn’t require entities to report how they use savings; rather it would require them to report the amount of savings and the patient mix to whom 340B drug inventory was dispensed. Trunk also said the HELP Act would require a 340B claim modifier on all claims submitted to third-party payers, including Medicaid, Medicare Part B, and Medicare Part D plans. The CMS adopted such a requirement for hospitals billing Medicare Part B for 340B drug inventory administered to patients in regulation in the 2018 final Hospital Outpatient Prospective Payment System rule--the rule that cut Medicare pay for 340B hospitals--and the HELP Act would extend this requirement to all 340B covered entities billing Medicaid, Medicare Part B, or a Medicare Part D plan. The pharmaceutical industry, however, supports both bills. Ripple Effect on Charity Care? The House committee’s report recommends defining charity care in order to use that as a threshold for determining which hospitals can participate in the program. Slafsky said charity care isn’t the appropriate way to determine eligibility for the program. He said charity care is just one portion of the care that hospitals provide and the more accurate metric to determine eligibility would be uncompensated care. Hospitals in the program provide a lot of care to low-income patients, particularly Medicaid patients, Slafsky said. Medicaid chronically underpays for health-care services, he said, so uncompensated care is a more appropriate measure to determine eligibility. Travis Jackson, with King & Spalding LLP in Los Angeles, told Bloomberg Law defining charity care could have implications for the federal tax exemption status of charitable hospitals. “Any attempt to define charity care for the 340B program could have unintended consequences for charitable status,” he said. Jackson represents hospitals and health systems. “We also think that if we’re going to have a discussion about transparency, it should also apply to the pharmaceutical industry,” Slafsky said. The program has grown dramatically since 1992, especially when the Affordable Care Act expanded its scope by expanding eligibility to more types of hospitals and by expanding Medicaid eligibility. Covered hospitals and clinics saved approximately $3.8 billion on their outpatient drugs in fiscal 2013, then $4.5 billion in FY 2014, and $6 billion during calendar 2015 through the program, the congressional report said. But Slafsky said the 340B program has grown due to a bipartisan decision by members of Congress to expand the program. He said the most recent expansion was to rural hospitals. While this expansion doubled the number of hospitals in the program, rural hospitals only purchase 3 percent of the drugs in the program, he said. Slafsky also said the $6 billion in 340B discounts is just 1.3 percent of the $457 billion of the U.S. drug market. “So you can’t argue that the 340B program is a major factor in determining pharmaceutical manufacturer pricing,” Slafsky said. Trunk said it’s unlikely that HRSA will attempt to revamp the program through regulation or guidance. HRSA delayed implementation of a final civil monetary penalties (CMP) rule relating to the 340B program until July 1, in part due to the Trump administration mandate to lessen burdensome regulations on business, and it’s highly likely the rule will be withdrawn, Trunk said. The final rule (RIN:L0906-AA89) from the Obama administration would provide HRSA with an enforcement mechanism when drug manufacturers intentionally charge a 340B hospital more than a drug’s ceiling price. The rule also defines the standards and methodology for calculating 340B ceiling price. Under the rule, drug manufacturers pay a penalty of $5,000 for each instance of overcharging a covered entity. The effective date of the final rule has been delayed several times, and most recently the rule was set to take effect July 1. Trunk also said prior legal challenges suggest that HRSA doesn’t have the authority to promulgate regulations to govern the program except in limited areas where statutory authority is specific. “HRSA seems gun shy given these past legal challenges as well as the Trump administration mandate for less regulation to attempt to address program issues or to clarify program requirements in regulations or sub-regulatory guidance,” Trunk said. A big issue for the 340B program in 2018 will be the fate of the CMP rule, Donna Yesner, an attorney with Morgan, Lewis & Bockius in Washington, told Bloomberg Law. Yesner represents clients in the pharmaceutical, biological, and medical device industries and is also a Bloomberg Law advisory board member. Yesner said some of the more administratively burdensome provisions in the rule might be rescinded. For example, she said the rule could be revised to allow manufacturers to aggregate overpayments and offset underpayments due to retroactive pricing adjustments and issue net refunds annually, which would be consistent with the Medicaid drug rebate program. “The rule also allows covered entities to replace drugs that commercial pharmacies sell to their customers at a price that the pharmacies set with 340B drugs, which may violate the statute’s prohibition against diversion,” Yesner said.